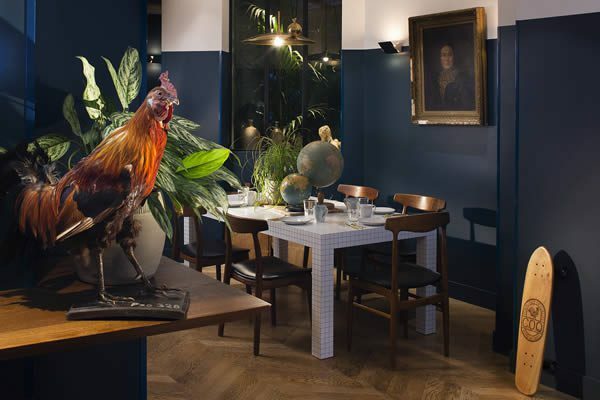 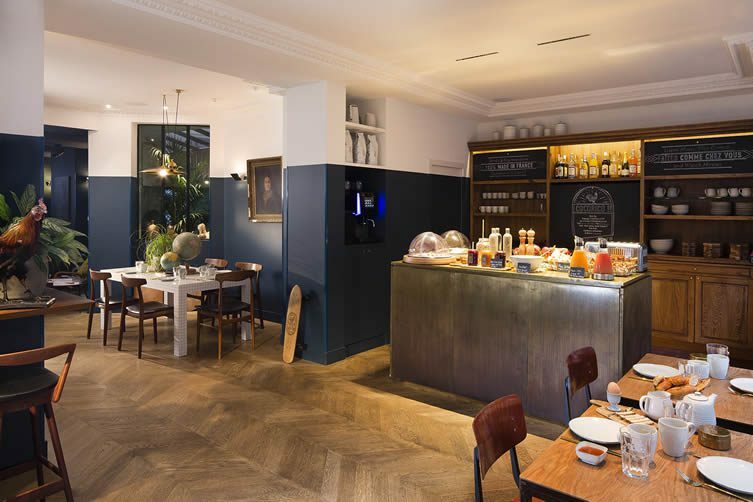 Hotel C.O.Q makes its home in an unassuming Haussmann style building in the unassuming 13ème district of Paris, yet Michel Delloye’s 50-room boutique hotel has made a name for itself through its intriguing interior design, a ‘made in France’ mindset and … an in-house chicken coop. 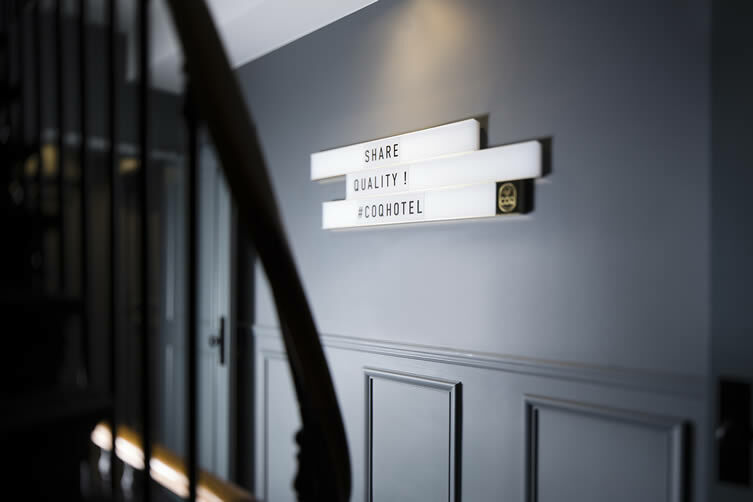 The ‘Community of Quality’ (which C.O.Q stands for) delivers just that: quality décor, produce and service under the one roof, alongside an authentic, welcoming feeling. 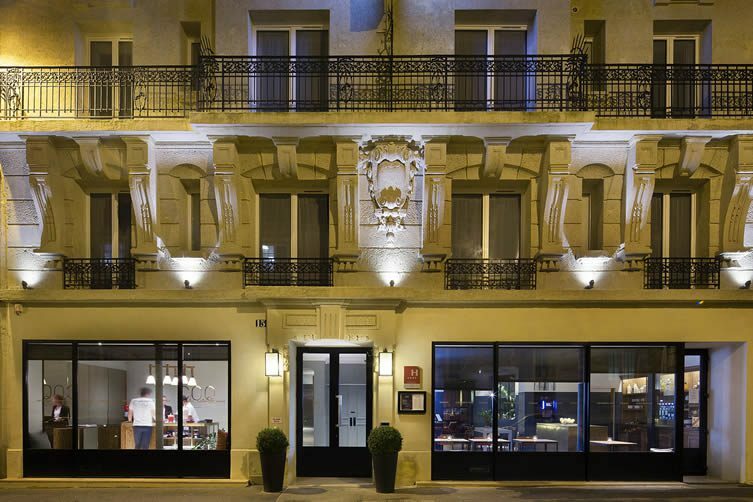 This is a hotel based on the ideal of a Parisian home, and at le C.O.Q the same cheery faces greet you day after day; welcoming you back, pouring you a glass of wine ,and even letting you choose which record you’d like to play as you unwind in the glass-roofed ‘winter garden’. 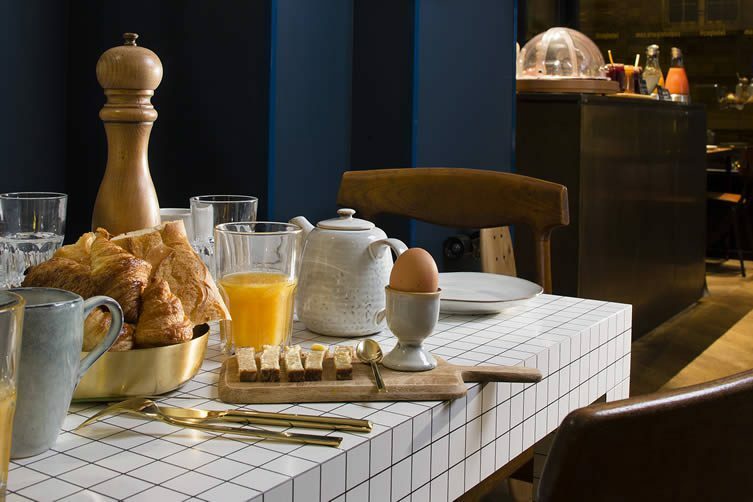 The hotel practically encourages you to come down in your slippers, go and say ‘bonjour’ to the chickens, and enjoy croissants and pastries from the local bakery. 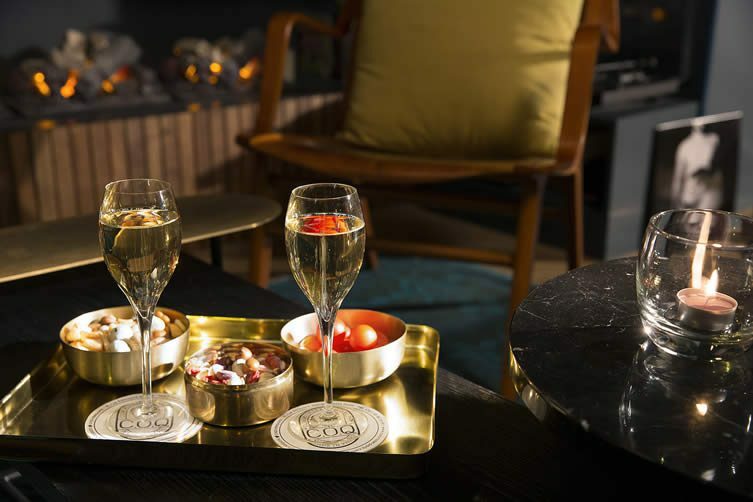 The warm fuzzy feeling from le C.O.Q.’s welcome is matched by a feast for the eyes created by Pauline d’Hoop and Delphine Sauvaget from Favorite. 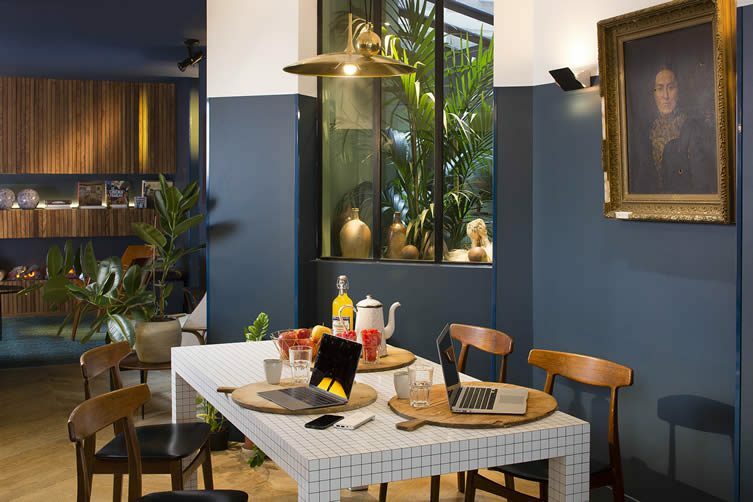 This local design duo have turned a relatively standard Parisian building into a paradise for fanatics of interior décor. 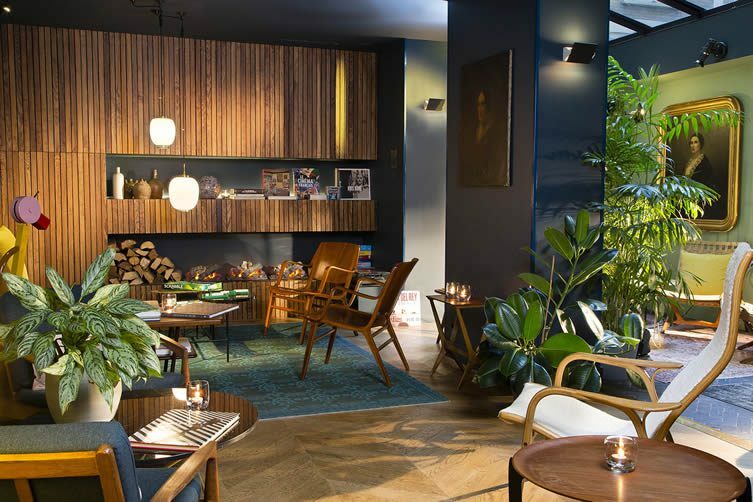 The ‘Winter Garden’ is the bar and relaxation area replete with tropical plants, bamboo furniture and deep green walls to make you forget the grey Parisian skies outside — low slung, mid-century modern couches beckon you to lie back and perhaps take in one of the hotel’s many film nights. 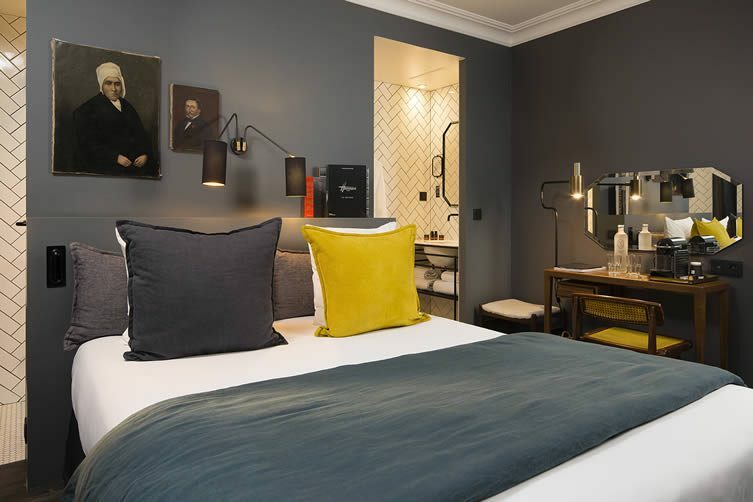 Each of the fifty guest rooms is uniquely decorated with the greeny-blue colour palette continued from the communal areas, and every piece of furniture has been sourced from flea markets or auction houses. 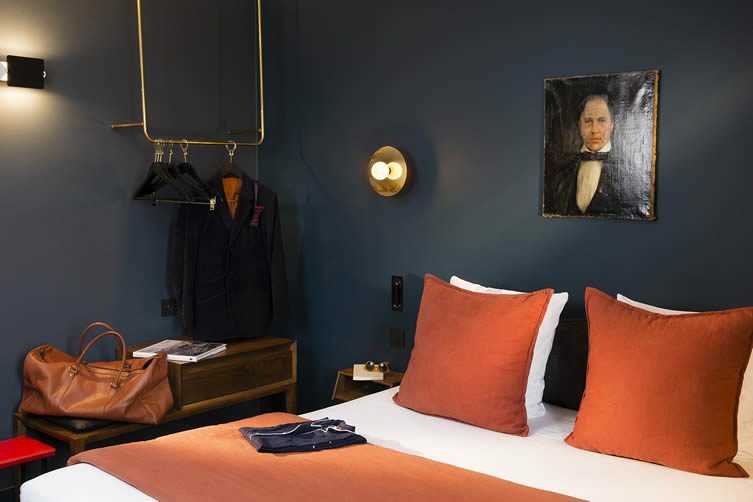 The mid-century pieces find their home beneath original oil paintings, giving the feeling that you’ve just walked into a Parisian home complete with portraits of their ancestors. 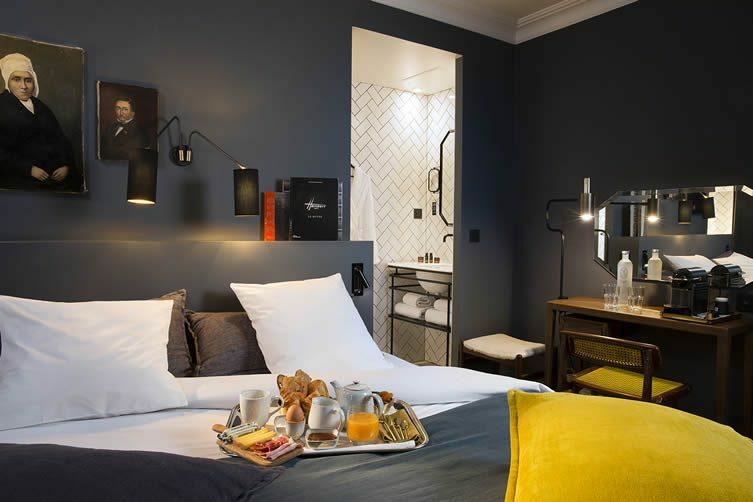 The ‘made in France’ philosophy continues from a stylish throw from D.U.S.T Paris to the Nid d’or mattresses; bathrooms take their leave from the contemporary decadence of Farrow and Ball deep blues to dress in a simple monochrome, complete, in some rooms, with a free-standing roll top bath which was just made for whiling away Parisian afternoons in. 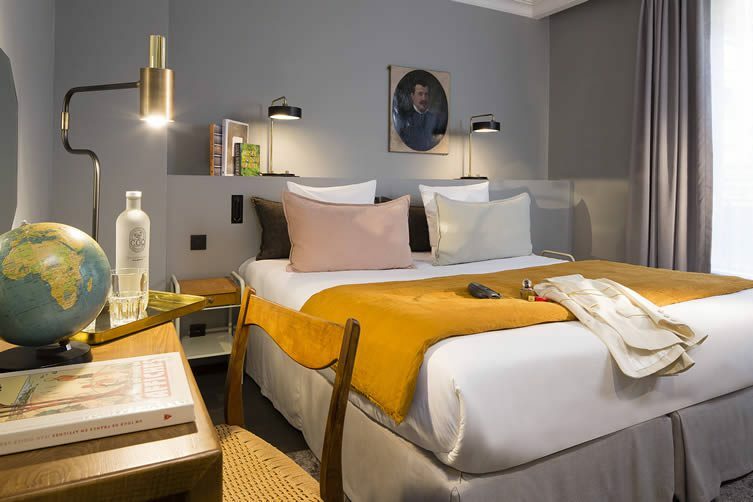 From urban chicken coops to vintage armchairs, cosy tropical corners to grand bathtubs, le C.O.Q hotel finds a perfect balance between contemporary and vintage, design-led and functional; the ideal Parisian home from home.